The street address for the FWC is 305 Friends Way, Harpers Ferry, WV 25425. However the Niles Cabin is tucked well back in the woods and since state-maintained roads stop prior to Friends Way, use of online mapping sites such as Google or Mapquest or onboard car GPS systems may not get you to our door and can even send you on a wild goose chase. The one GPS application for iPhones, Androlid and Windows phones that we know will get you all the way to our door is WAZE which may be downloaded for free. If you do not have WAZE installed and readily available for use on your visit, we suggest that you read and print out the detailed directions provided below and to be on the safe side, we recommend that you contact Sheila Bach, the FWC General Manager, at (304) 728-4820 or snbach@earthlink.net so that she may offer you the best directions from your point of departure and give you verbal or written guidance all the way to the Niles Cabin. While almost all cars can handle the road into the FWC with relative ease and safety, the last 1.5 miles of road leading to the Niles Cabin/FWC Headquarters are on a narrow, unpaved, sometimes rutted and bumpy road that may not be suitable for cars that are low to the ground and with a short wheelbase (e.g., Smart Cars or Minis). Before risking damage to your car or getting stuck please contact Sheila Bach to discuss current road conditions and the advisability of driving your particular car out to the FWC. For those who have difficulty driving at night, we recommend timing your departure so that you can reach the paved portion of Mission Road before dark since the road back out the highway can be hard to follow in the dark. Sheila may also be able to assist you in car-pooling to a program so be aware of that option as well. 1. It appears that both Mapquest and Google Maps have finally gotten their maps of the roads leading to FWC updated to reflect the new Route 9 highway link over the new Shenandoah River bridge leading to Route 340 outside of Charlestown WV. Where Route 9 and Route 115 (Charlestown Road) ran together to Mission Road in the past, now they are separately numbered and ONLY Route 115 (Charlestown Road) runs past the turn-off for Mission Road. The following map shows this with (1) showing the left turn onto Route 115 for those coming from the East, (2) showing the exit for Route 115 from Route 340, and (3) showing the turn for Mission Road. A 'Heads Up' for those traveling west on Route 9 from Loudoun County: As soon as you come over the Blue Ridge leaving VA (the road levels out) be ready to make the sharp left onto Charles Town Road (Old Route 9) as it comes up faster than you expect. Take the left turn onto Charles Town Road (WV Route 115) DO NOT GO STRAIGHT - and follow the road as shown above through the little hamlets of Mannings and Mountain Mission to reach the left turn onto Mission Road. Note: All online directions and mapping stop at the "Y" start of Friends Trail and continuation of Friends Way. When you reach the Y, you will need to follow the detailed directions provided below. From both directions, the turn from WV Route 115 (Charles Town Road, Old Route 9) onto Mission Road is well marked. From this turn, pay careful attention to your car's trip meter or odometer. Go 6.4 miles and turn left onto a gravel road that is still Mission Road. Go one mile and turn right still on Mission Road. Go about 1/4 mile and make a sharp left turn onto Christ Church Road. Very shortly turn right onto Friends Way. After a short distance you will come to a "Y" where you have a choice of bearing right or going straight. Bear right to continue to Niles Cabin. Shortly, at a sharp bend in the road you will drive through a usually shallow stream (Krishna Brook). Proceed slowly across the stream (shown below) and then up the hill and left around a corner to the Niles Cabin. Go straight onto Friends Trail towards the Mongolian Yurt, the Tree House, and the Fire Circle. The Friends Trail is blaze-marked by blue plastic diamonds. In about 1/4 mile you will turn left onto Grand Boulevard. (DO NOT go straight.) Then take a right turn back onto Friends Trail. You will come to a small parking area. On the back left of this parking lot starts a trail blaze-marked with blue plastic ribbons. This leads you up to the Mongolian Yurt, Tree House, and Fire Circle. While you can walk straight up the dirt road, the trail to the left is easier. DO NOT try to drive up the dirt road. The above photo shows Friends Way where it crosses the shallow ford (aka 'The Quaker Car Wash) at Krishna Brook. The Niles Cabin is up the hill and around the corner to the left. This ford may be safely and easily crossed by most cars except during or after downpours when the level and current may both be too high to cross safely. 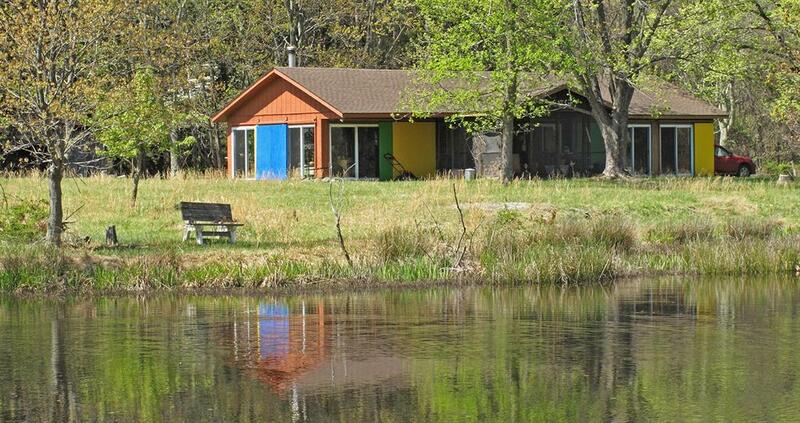 The above photo shows the Niles Cabin viewed from across the small pond behind the cabin in early April. You will arrive and park on the side of the cabin that is hidden in this picture.